There are some things God is not willing to do, and this is marvelously portrayed in the three parables that comprise Luke 15. Jesus told them in response to the Pharisees and teachers of Jewish law who were offended that tax collectors and sinners were coming to Jesus and were even more offended because Jesus welcomed them and ate with them. The parables are about a lost sheep, a lost coin, and a lost son. Suppose one of you has a hundred sheep and loses one of them. Doesn’t he leave the ninety-nine in the open country and go after the lost sheep until he finds it? And when he finds it, he joyfully puts it on his shoulders and goes home. Then he calls his friends and neighbors together and says, “Rejoice with me; I have found my lost sheep.” I tell you that in the same way there will be more rejoicing in heaven over one sinner who repents than over ninety-nine righteous persons who do not need to repent. Clearly, the answer is, Yes, the Pharisees, if they were shepherds, would go out and find that lost sheep. They would not be content with the ninety-nine while one was still out in the wild. The stray was just as valuable to them as the ones that did not stray. Of course, we think immediately of Jesus in this story, not simply because he is the one telling it but because we recognize him as the Good Shepherd who lays down his lie for his sheep (John 10:11). He is the one the psalm writer cries out for: “Save your people and bless your inheritance; be their shepherd and carry them forever” (Psalm 28:9). He is the one the prophet foretold: “He tends his flock like a shepherd: He gathers the lambs in his arms and carries them close to his heart; he gently leads those that have young” (Isaiah 40:11). The second parable, in Luke 15:8-10, tells of the woman and the lost coin. Like the first parable, it is very brief, but just as powerful. Or suppose a woman has ten silver coins and loses one. Doesn’t she light a lamp, sweep the house and search carefully until she finds it? And when she finds it, she calls her friends and neighbors together and says, “Rejoice with me; I have found my lost coin.” In the same way, I tell you, there is rejoicing in the presence of the angels of God over one sinner who repents. Imagine this woman with ten silver coins. They are likely her dowry and so would be very precious to her. But she has somehow lost one. Perhaps it fell into the cracks between the stones in the floor. She still has nine coins left, but she is not content to leave it at that. She is unwilling to let that tenth one go. So, she turns the house upside down searching diligently for it, shining a light into every dark corner, sweeping the floor in case she might hear it clinking in some crevice. She will not give up. She will not even think of giving up but will keep searching for it until she has found it. And then how great will be her rejoicing. If the shepherd in the first parable points us to Christ the Son, and the father in the third parable, which we will come to next, is like God the Father, it seems only natural that the woman in this middle parable may perhaps be likened to the Holy Spirit. We would not be alone in thinking that. St. Ambrose, back in the 4th century understood it that way. The Holy Spirit is always bearing witness to of us Christ, taking the things that are his and revealing them to us. How shall we suppose that the Spirit of God would ever stop before every dark corner has been made light, every crevice has been swept clean, and that which is lost has been found? Now we come to the longest of the three parables, too long to quote in full here but found in Luke 15:11-32. In this tale, there is a man, a father who has two sons. One day, the younger son comes to his father and asks that his share of the inheritance be given to him. This is terribly dishonoring to his father, tantamount to saying that all he wants from his father is his wealth and that his father might as well be dead. Nonetheless, the father loves his son. Indeed, he loves both of his sons greatly and he gives them both their inheritance. The younger son takes it and goes off to a distant land, as distant as his heart is from his father. There he wastes away all he has received, squandering it in reprehensible ways. But then there is a catastrophe: a terrible famine comes upon the land, and the younger son, his wealth now gone, must hire himself out to a farmer who has him feed the pigs — quite a lowly job to begin with, but especially shameful work for a Jewish boy. After a time, the younger son comes to his senses and realizes the terrible state he is in and how much better life had been for him at home. He decides to go to his father and beg to come back home, not as a son but as a servant. Now, while he is still a good way off, his father sees him on the horizon, for he has never stopped watching for his son, being unwilling to give up on him. Then the father, in a culturally undignified act, girds up his robe and runs to embrace his son. The son is hardly able to get a word out of his mouth about how unworthy he is to be a son before the father cuts him off, commanding his servants that the best robe be put on his son, a ring placed on his hand and the bests sandals put on his feet — all of them signs that the father fully accepts him as his son. “Bring the fattened calf and kill it,” the father says, “Let’s have a feast and celebrate. For this son of mine was dead and is alive again; he was lost and is found.” So, they all celebrate and are very merry. End of story. Or not. Remember, there is also an older son — an older brother. He finally becomes aware of all the commotion and asks his servant about it. “Your brother has come home,” the servant says, “and your father has killed the fattened calf because he has him back safe and sound.” The older brother becomes enraged and refuses to join in the celebration. But the father loves both of his sons, so he goes out to find the older one, who has distanced himself not only from his younger brother but from his father as well. 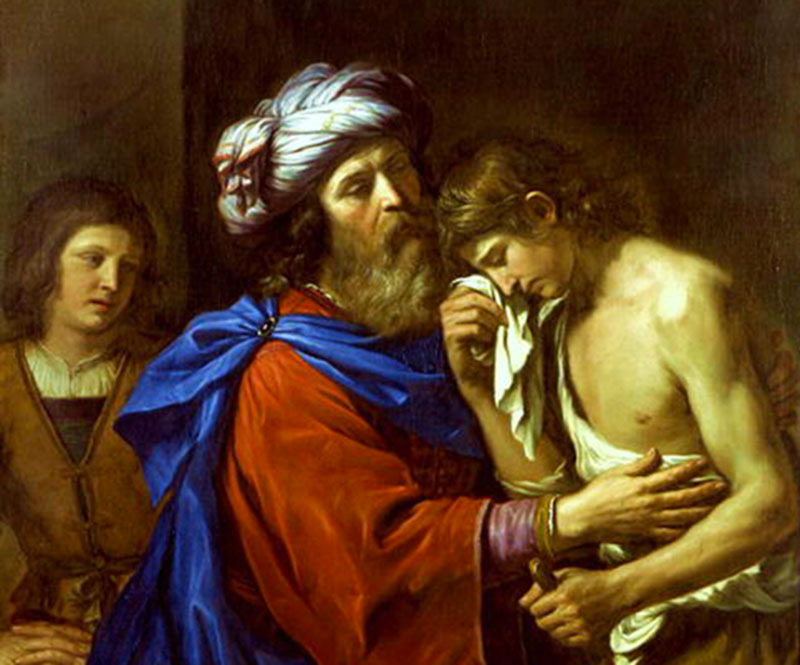 The older son pours out his fury, about how he has always obeyed and slaved for his father but was never given even a young goat to celebrate with his friends; about how the younger son, “this son of yours,” has whored everything away — and now here is the father welcoming him home with the greatest of feasts! This is how God is. God is like the shepherd who is unwilling for even one of his sheep to remain lost. God is like the woman who is unwilling to let even one precious coin remain missing. And God is like the father who is not willing to let either of his sons remain unreconciled. See, it is not God’s will that anyone perish but that everyone come to repentance. There is never a point at which God gives up on anyone. Never. God’s love always perseveres, and not even death can finally keep God’s love or God’s will from prevailing. In 2 Peter 3:9 who is the audience this text is being spoken to? Who is the "us" in regard to the statement God is "longsuffering toward us."? This text is a pre-70AD text and is promising the judgement upon Jerusalem will come. But judgement is being sustained until the last of His elect has come to Him. If "us" meant all of mankind, then all would have come to Him and there would have been no need for the Judgement that fell on Jerusalem in 70AD. Perhaps, Anthony, but not necessarily. But thank you for your comment. If the apostle Peter is indeed the author of this letter, then it would necessarily be dated before AD 70, since Peter had already been crucified by then. OTOH, if Peter is not actually the authorr, then it may very well have been written after AD 70. (I do not debate whether Peter is or is not himself the author of this epistle). If written after AD 70, then it would not be referring to an event which had already past. But even if written before AD 70, it does not necessarily refer to the AD 70 destruction of Jerusalem. Such an identification is really nothing more than a speculation. Yet, even if the context were about the AD 70 destruction, as speculative as that may be, I don't think the longsuffering of God would be limited by that. I think that God's unwillingness that any should perish and God's desire that all come to repentance is applicable here in particular because it is true in general. Indeed, as Paul says, God commands all people everywhere to repent (Acts 17:30).